Ten river basins drain about 11,459 square miles in Western North Carolina. The New River, in the northeast corner of the region, is thought to be one of the oldest in the world. The region’s river basins have some of the most outstanding and diverse aquatic systems within the state. However, the health of these systems is threatened by human actions such as pollution, impoundments, and poorly mitigated land management activities. Mussels, crayfish, snails, salamanders, and many species of freshwater fish, such as native brook trout, are then at risk due to poor water quality and altered hydrology. Historically, the region has maintained a bountiful supply of fresh water for residential, commercial, and industrial use; however, recent droughts have increased awareness of the need for water conservation. A river basin catches all the water flowing downhill into streams and creeks and, eventually, carries it out to sea. In Western North Carolina, there are ten river basins split by the Eastern Continental Divide, five draining to the Gulf of Mexico (New, Watauga, French Broad, Little Tennessee, and Hiwassee) and five draining to the Atlantic Ocean (Roanoke, Yadkin, Catawba, Broad, and Savannah). These basins contain the headwaters of streams and rivers that provide a critical supply of fresh water to towns and cities in and outside of the region. The southern Appalachian Mountains serve as "water towers" for the southeastern United States. To view the importance of the region's water assets on a national and regional scale, please access the USDA Forest Service's Forest to Faucets project website. This project uses GIS to model and map the continental United States land areas most important to surface drinking water, the role forests play in protecting these areas, and the extent to which these forests are threatened by development, insects and disease, and wildland fire. The health of aquatic ecosystems in the region can be adversely impacted by habitat destruction due to development, point and nonpoint source pollution, hydrologic alteration, and poorly managed agriculture and forestlands. Though water quality has improved in the past few decades, habitat degradation continues to threaten the overall health of these unique aquatic ecosystems. Other threats include impoundments on major rivers and tributaries that block fish migration patterns and cause habitat fragmentation. Fortunately, increasing attention is being focused on analyzing aquatic systems, identifying the causes of endangerment, and applying conservation strategies. From national groups such as the World Wildlife Fund and the Nature Conservancy to more locally-based organizations like the North Carolina Wildlife Resources Commission, there is research being conducted with the goal of preserving these valuable aquatic ecosystems. To access the North Carolina Division of Water Quality website setting forth Basinwide Water Quality Plans by river basin, please visit http://ncdenr.gov/web/wq/ps/bpu. The following evaluations of the river basins in Western North Carolina are a brief summary of the threats identified in the North Carolina Wildlife Resources Commission Action Plan for Aquatic Habitat Conservation. The Hiwassee River basin is relatively stable with good water quality. It is impacted from nonpoint sources, primarily erosion, which increase as streams flow into the more developed valleys and merge into larger water areas. Erosion and sedimentation are primarily from ground disturbance from development activities (residential, commercial, transportation, and utility) and agriculture (erosion from poorly managed pastures and row crops). Timber harvest with insufficient erosion controls may be another contributor of sediment to the basin, along with other nonpoint source pollutants, such as runoff from built-up areas and roadways. Pointsource discharges are not a current major pollutant of the Hiwassee River basin. Hydropower development has altered and degraded many habitats for most indigenous aquatic species. Un-impounded areas are affected by decreasing water temperature, altered hydrologic processes, and low levels of oxygen due to releases from the Chatuge and Nottely dams. Invasive species are also potential threats to the native aquatic species living in the basin. The blueback herring appears to have an impact on game species in the area, as well as the Asian clam and striped bass. Major problems affecting species and habitats within the Little Tennessee River basin include impoundment and excessive erosion and stream sedimentation from development and agriculture. Of the entire 144-mile Little Tennessee River, there are only 47 miles in Georgia and North Carolina that remain un-impounded. Portions of the basin are currently at good quality levels, but it does have some impaired waterways, including the Cullasaja River, Mill Creek, upper Little Tennessee River, Beech Flats Prong, and West Buffalo Creek arm of Santeetlah Reservoir. Invasive, non-native species like the yellowfin shiner, which is expanding downstream from Franklin, are a potential problem to the basin. The Asian clam is established in both the Little Tennessee and Tuckasegee Rivers, Chinese snails have been found in Cowee Creek, and the rusty crayfish is established in at least one area downstream from Fontana Reservoir. The native spotfin chub was recently found to be infested with a tapeworm from Asia. Exotic pathogens and parasites pose serious threats to the rare species inhabiting the Little Tennessee River basin. National forest and state park lands occupy the majority of the Savannah River basin, but development is increasing on private lands. Land clearing, removal of riparian vegetation, and rural roads are all potential nonpoint source problems. Numerous small impoundments fragment headwater regions. The basin’s major tributaries in North Carolina are also upstream from larger impoundments in Georgia and South Carolina. More monitoring is needed to address to what extent invasive species have become established in the Savannah River basin. The most widespread problem facing the French Broad River basin is habitat degradation from nonpoint source pollution. Large development, urbanization, and agriculture are also evident nonpoint sources of pollution and sedimentation. Highway development and construction pose significant threats to many areas of the French Broad River basin, along with poorly managed steep slope development contributing runoff and sedimentation. Nutrient enrichment is a more serious issue in this basin than in any other basin in the region. Increasing in severity are threats from hydrologic modifications, from activities such as impervious surfaces, floodplain filling, and stream channel alterations. Not as widespread as nonpoint sources of pollution, point sources are still a significant problem causing habitat degradation in the basin. Impoundments pose a smaller threat to this basin than to other basins in Western North Carolina, but are still cause for concern in some portions of the basin. Specifically within the French Broad River sub-basin, point source pollution, including both current and lingering effects from past pollution, contributes significantly towards habitat degradation and the extirpation of priority species. The Pigeon River sub-basin has a long history of point source pollution. Toxic wastes were discharged directly to the Pigeon River for much of the 20th century, eliminating many priority aquatic species. Treatment began in the early 1990’s to improve water quality and the recovery of many native species has been favorable, though the River continues to be heavily monitored. More research is needed to fully assess effects of invasive species in the French Broad River basin. The native longear sunfish has been displaced entirely by the non-native redbreast sunfish, and a few other invasive species have been established in segments of the basin, but exact influences on game versus non-game communities are not known. 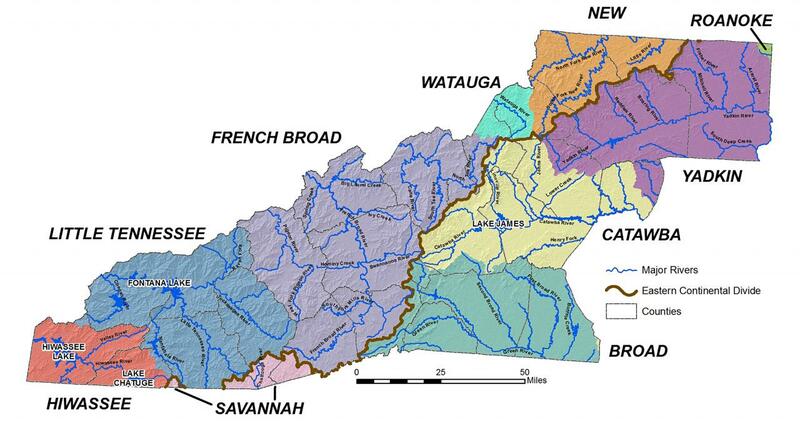 The predominant impact on water quality in the Broad River basin is habitat degradation from sedimentation originating from construction, row crop agriculture, timber harvest, mining, stream bank erosion, and runoff from unpaved rural roads. Stream bank vegetation is either significantly or entirely lacking throughout the basin, leaving the waters more susceptible to runoff. Water quality is declining due to channel alterations in both rural and urban areas of the basin, combined with the escalating amount of impervious surfaces which lead to drainage problems. Waste water treatment plants and industrial discharges are the primary point source polluters. Aquatic communities are impacted from impoundments at Lake Lure, Kings Mountain, and Lake Adger. With a steadily increasing human population, demand is growing for water supply from surface waters. Water withdrawals, impoundments, and interbasin water transfers will have a serious effect on species in these aquatic areas. The most severe threat facing the Catawba River basin is impoundment. Almost the entire basin is either impounded or regulated by hydropower projects. The release of colder water causes wildlife degradation, as many native species are unable to adapt to the abrupt changes in water temperature. Migration routes are limited, if not completely impassable, due to dams. Other causes of degradation in the basin include sedimentation from ground disturbance from development and agriculture, loss of streamside vegetation, water withdrawals, point source pollutants (waste water treatment plants and permitted industrial dischargers), and nutrient loading. The numerous non-native species inhabiting the basin includes Asian clams, grass carp, blue, channel, and flathead catfishes, smallmouth bass, muskellunge, white bass, yellow bass, and rainbow and brown trout. Blueback herring, alewife, and white perch are also known from several impoundments. There are non-native flora species present in the Catawba River basin as well, particularly in the reservoirs, but the specific effects on the native communities require further research. At present, water quality conditions of the Watauga River basin are very favorable, but there are lingering effects from past pollution occurrences. Sedimentation and erosion from nonpoint sources is a primary threat affecting the basin. The drastic lack of streamside vegetation and overly narrow riparian corridors have caused excessive erosion and habitat loss due to sediment deposition and the over-widening of water channels. Residential and agricultural development is on the rise, which also raises the threat of habitat loss through increasing erosion. Christmas tree farming in the basin may also add pesticide and herbicide pollution to streams. Although it exhibits overall good water quality, the New River basin is affected by localized problems and habitat degradation in many of the streams inhabited by priority aquatic species. Development and land clearing, poorly managed livestock grazing, unpaved rural roads, and loss of streamside vegetation all contribute to ecosystem degradation. New home construction, primarily on steep slopes, is increasing steadily. Sedimentation impacts are very serious, particularly in larger tributaries and in the main stem of the New River. There are also increases in water withdrawals as a result of larger populations moving into the area, a problem primarily in the upper South Fork New sub-basin. Degradation in water quality is a result of acid mine drainage, urban runoff, and discharges from waste water treatment plants. Like the Watauga River basin, herbicides and pesticides used in Christmas tree production also impact the New River basin, but to what degree is still uncertain. Threats also emerge from the numerous non-native aquatic species established throughout the basin. There is limited information and inadequate surveys on aquatic species distribution in the upper region of the Yadkin. Invasive species have undoubtedly become established in the basin, and are likely having a negative impact on native populations, though the exact effects are unknown. Dams and impoundments to the east of the region pose a serious threat to the Yadkin River basin. Destruction of aquatic habitat appears to be the largest water quality issue in the Roanoke River basin. Sedimentation caused by agriculture, forestry, and construction has degraded water and habitat quality. Also, demand for water is becoming a contentious issue in the basin – demand for water is expected to increase as much as 55% by 2020. Several development-related issues affect the Roanoke River basin. In addition to nonpoint source pollution, point source pollution (such as municipal waste water treatment plants, selenium ash pond discharge, industrial facilities, small package treatment plants, and urban and industrial storm-water systems) can degrade aquatic habitats. Finally, the amount and timing of water releases from dams, particularly along the Roanoke River, can alter downstream aquatic and riparian flora and fauna. There will be a continuing need to balance water releases to meet human and aquatic ecosystem needs. NC Wildlife Resources Commission. “North Carolina Wildlife Action Plan, North Carolina River Basins, 2005.” Accessed from: http://www.ncwildlife.org/plan.aspx. NC Wildlife Resources Commission. “Basinwide Planning Program: 2002 Little Tennessee River, Basinwide Water Quality Plan, Water Quality Issues Related to the Entire Little Tennessee River Basin.” Accessed from: http://www.wildlifeactionplans.org/pdfs/action_plan_summaries/north_carolina.pdf. North Carolina Department of Environment and Natural Resources, Office of Environmental Education. “Savannah River Basin, 2007.” Accessed from: http://www.ee.enr.state.nc.us/public/ecoaddress/riverbasins/savannah.150dpi.pdf. North Carolina Department of Environment and Natural Resources, Office of Environmental Education. “New River Basin, 2007.” Accessed from: http://www.ee.enr.state.nc.us/public/ecoaddress/riverbasins/new.150dpi.pdf. Clean Water for North Carolina. “A River in Jeopardy: The Yadkin and Pee Dee Rivers of North Carolina,” Carpenter, B., et al., October 2002. Accessed from: http://www.cwfnc.org/Yadkinreport.pdf.